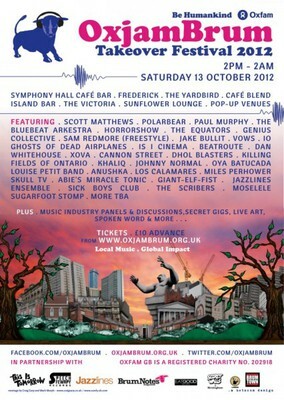 Lots of good music and a global impact, that's what OxjamBrum Music Festival is all about. On Saturday, 13th October, the city centre of Birmingham will be taken over by 40 local artists performing for 12 hours non-stop. To be part of OxjamBrum, you need to get your wristband (for only £10, in advance). The line-up includes such names as Paul Murphy (from The Destroyers), Los Calamares, Oya Batucada, Horrorshow, Genius Collective, Polar Bear, among others. If you fancy supporting local artists and also raising funds for a very serious charity organisation, don't miss Oxjam Brum 2012. The festival this year will take over at Sunflower Lounge, The Yardbird, Café Blend, Frederick, Island Bar, The Victoria and Symphony Hall Café Bar. 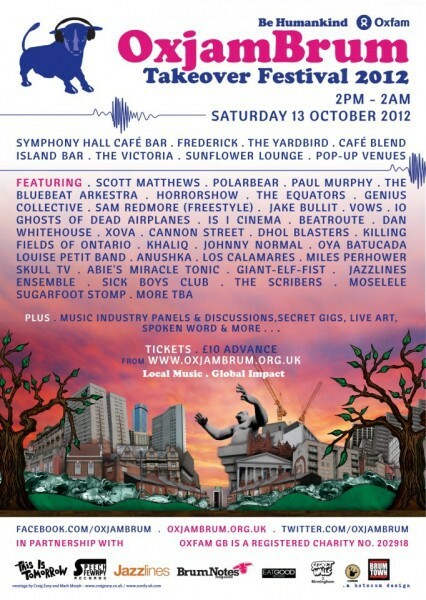 Get your tickets for OxjamBrum 2012 here.